What do we want from our bathroom window treatments? Privacy, light, style and endurance. Not much then. Whatever window covering we opt for, we expect it to allow plenty of light in and keep our ‘privates’ completely private. Not to mention endure heat and moisture whilst retaining its good looks and adding to the aesthetics of our design. Here are six alternative ideas to curtains, blinds and the dreaded net curtains to give you privacy, light and spare the neighbours from getting an eyeful. Window film is a relatively cheap option that is easy to apply. It allows light to filter in, looks chic and offers some degree of privacy. It’s ideal for obscuring the view during the daytime, but it won’t completely hide you at night. Widely available in DIY stores and online – try Brume.co.uk – window film comes in a wide range of patterns, colours, opacity, made-to-measure options and allows for personalisation. However, a degree of patience and accuracy is required to get the best results when applying window film. It’s also a great temporary solution for renters who want to put their own stamp on rented accommodation as it can be removed when necessary. 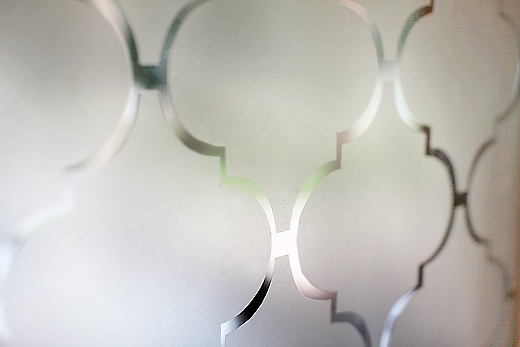 Contact paper is favoured by keen DIYers and crafters as an alternative to window film. Transparent until applied to windows, this versatile medium allows you to completely personalise your design by using a cut-out template to create a repeat pattern. Check out Seventh House on the Left’s blog for instructions on how to get creative with contact paper. 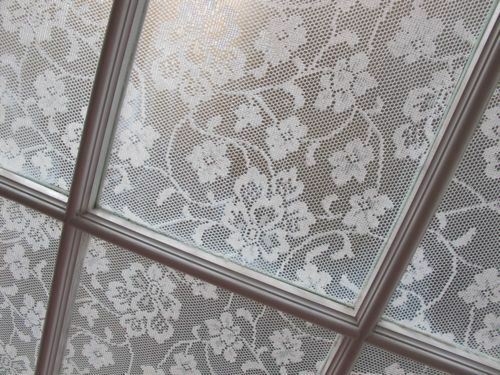 Another window treatment that’s being explored by crafters is lace. Huge on vintage appeal, this delicate fabric complements shabby chic designs and is another cheap option for providing daytime privacy. Whilst it may look great, its endurance is questionable in the humid and damp atmosphere of the bathroom. However, as lace can often be picked up cheaply in charity shops, the window treatment could be replenished if mould takes hold. 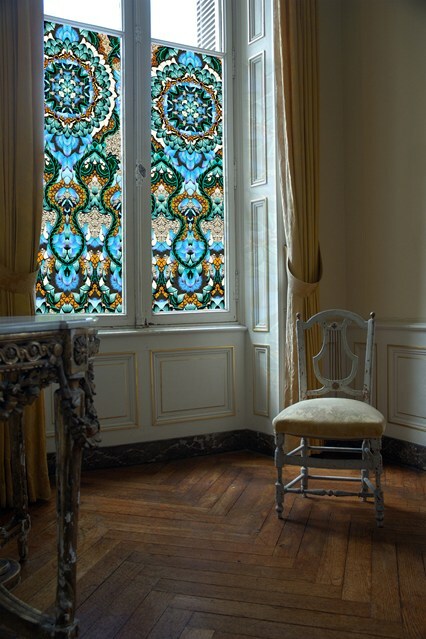 Check out Annabel Vita’s blog for instructions on how to apply lace to your window. If you can’t be doing with DIY products, such as films and sprays, to evoke the beauty of frosted glass, opt for the real deal. 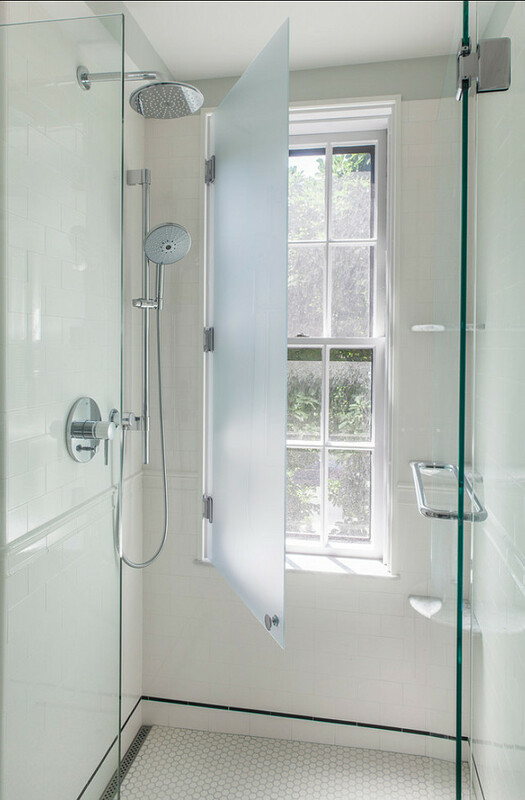 Frosted glass shutters look simply stunning in contemporary bathrooms and can provide a slick solution for privacy, whilst protecting windows in close proximity to showers and baths. You don’t need a beach themed bathroom to include wooden shutters in your design. In fact, opt for white painted shutters for that sophisticated colonial feel. Open them fully or adjust the slats to give you complete control over light and privacy. This window treatment scores highly on versatility, privacy and style, especially when used in conjunction with window film. If you’re concerned about the longevity of wooden shutters in your bathroom, opt for a good quality plastic alternative instead. 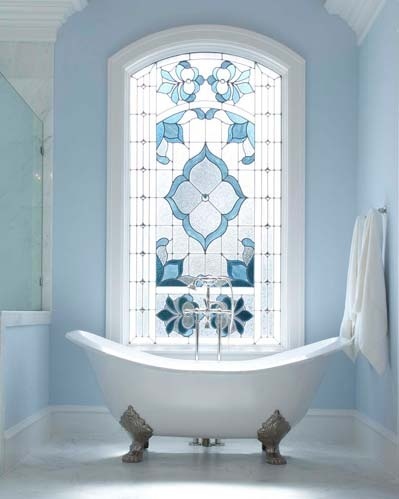 Stained glass windows look amazing in bathrooms. Not only do they transform your window into a major area of interest, they deliver a degree of privacy without obscuring too much light. Source them from house clearances and salvage or reclamation yards, or replicate with a window film if your budget is limited.